The Plastics Roadmap for Finland, prepared by a cooperation group appointed for this purpose, has been submitted to Minister Tiilikainen. The roadmap is the first step towards a new, sustainable plastic economy. 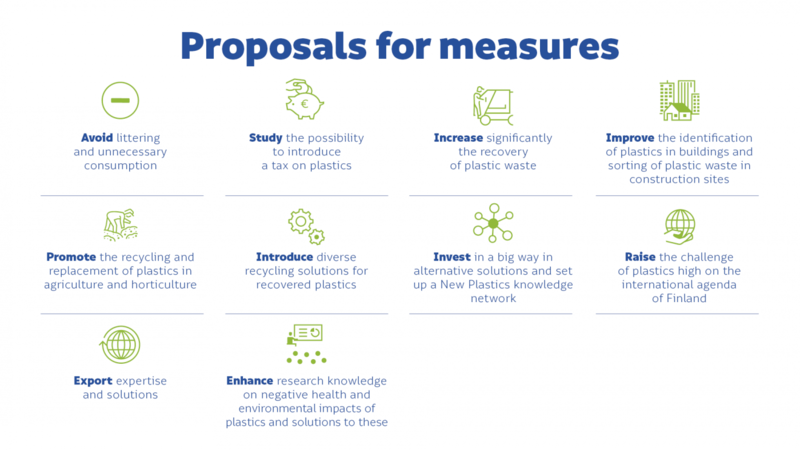 Of the more than 100 proposals made, the roadmap now presents a set of key actions to find solutions to challenges caused by plastics. “The working group prepared the Plastics Roadmap very quickly and showing great enthusiasm. At the Ministry of the Environment we will study very closely especially the proposed measures that concern the central government”, says Minister of the Environment, Energy and Housing Kimmo Tiilikainen. “Finland’s Plastics Roadmap is the first one of its kind and could well serve as a trendsetter for other countries. A key issue both in the preparation process and in implementation is cross-sectoral cooperation. Inputs from all of us are needed to put the roadmap into practice”, says Member of Parliament Hanna Kosonen who chaired the cooperation group. “The plastic challenge is one of those problems that cannot be solved by any simple tricks. To tackle the challenge we need consumers, companies, research and innovation, technology, and legislation and policies”, says Tuula Varis, Director-General at the Ministry of the Environment and vice-chair of the cooperation group. ”The use of plastics keeps growing, and we must take a sustainable path in this. There are enormous global business opportunities for companies that offer advanced recycling solutions for plastics or ways to replace oil-based plastics by sustainable bio-based products and, depending on the purpose of use, biodegradable materials”, says Minister of Economic Affairs Mika Lintilä. “Finland can be a global leader in this. With our strong expertise in biomaterials, renewable raw materials and through research, innovation and even closer cooperation we can find cost-efficient and scalable solutions for use by the manufacturing industries”, Lintilä continues. Plastics have lots of good properties, which is why they are used so much and they are so important for our economy. However, there are also significant problems relating to plastics. In the roadmap the working group presents solutions to respond to the plastic challenge and attract a broad spectrum of stakeholders to take action. To avoid littering and unnecessary consumption, local governments and organisers of various kinds of events are challenged to making sure that the events are litter-free, and voluntary green deals are suggested to reduce single-use packages and over-packaging. The cooperation group also hopes that the possibility to introduce a tax on plastics would be considered as a way to reduce the use of disposable plastics and boost the search for alternatives. To improve the recovery of plastics the requirements concerning separate collection must be revised and the recovery and collection sites must be significantly increased, including by expanding the property-specific and regional collection systems and organising collection for blocks of detached or semidetached houses. Experiments are needed to study the options for separate collection, and more consumer advice is also needed. The Plastics Roadmap presents specific actions for two sectors. The identification of plastics in buildings and sorting of plastic wastes at construction sites should be improved. There are still weak spots in the recycling of agricultural and horticultural plastics that need to be addressed, and new bio-based and 100% biodegradable mulching materials must be developed and taken into use to substitute for plastics. However, better recovery of plastics alone is not enough, but the further processing and use of the plastic waste that has been collected must also be improved. The working group stresses the need for more and increasingly diverse recycling solutions for different value chains, including an assessment of the suitability and impacts of chemical recycling. The cooperation group estimates that one or two new full-scale processing plants for plastics and a unit or units for chemical recycling are needed. According to the Plastics Roadmap, the plastic challenge is also an opportunity for Finland. Around the world there is a growing need for safe, bio-based, recyclable, and also 100% biodegradable packages. Finland has strong expertise in biomaterials, as well as raw materials that offer opportunities to find solutions for replacing plastics. The cooperation group considers that right now significant inputs are needed in these solutions, and proposes that we establish a national programme and New Plastic Finland network of expertise to promote this. Further development of our expertise in plastics also serves the export efforts of Finnish companies. Plastic challenge should also be high on the agenda in Finland’s international affairs. Among the best ways to influence marine littering in the worst areas would be to make donations to specific sites that would serve to showcase and launch new solutions. In addition, the cooperation group proposes a set of research projects to study the negative health and environmental impacts of plastics and solutions to these. Parties that will implement the measures listed in the roadmap and their cooperation partners have been designated for each measure. Some of the proposed measures are such that they require a longer timeframe and additional resources. The launching of the measures and progress made in their implementation would be evaluated in spring 2009. All the ideas collected during the preparation process of the roadmap are presented in the annex. These ideas as well as the enhanced knowledge of the matters involved are hoped to serve as inspiration to take further action. The roadmap was prepared and submitted by a broadly-based cooperation group appointed by the Ministry of the Environment and supported by a secretariat composed of experts. Representatives from ministries, research institutes, civil society organisations and business life took part in the work. In addition, large numbers of other stakeholders and private citizens had the opportunity to participate via online discussions and workshops. The members of the cooperation group and its secretariat are listed in the letter of appointment.